A colour version of the pipes at Manly Beach. 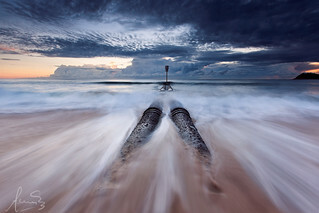 While the horizon looked stormy, the morning was perfect for photography at this location on the northern beaches. High tide, without massive waves, allowed me to position the tripod to capture the incoming waves, and outflowing water. Manly is located on northern beaches of Sydney. It is linked to the city by the Manly ferry and is home to the famous Corso.